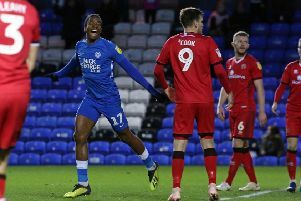 Bury, a team without a win in their last 20 matches, a run that stretched back to September 27, crushed promotion-chasing Peterborough United 5-1 in their League One fixture at Gigg Lane. Home striker James Vaughan will rightly steal the headlines with four goals, all scored in the opening 26 minutes, and after Posh had taken a fourth minute lead through Tom Nichols. Posh defended woefully and attacked inconsistently leaving, presumably, angry manager Grant McCann to make three half-time substitutions. It worked in that Bury only scored one further goal through substitute George Miller who pounced on a rare error by Posh ‘keeper Luke McGee in the 72nd minute. It took Chelsea 76 minutes to score four against Posh last week, but Vaughan managed it in a 20-minute first half spell of a traumatic afternoon for McCann’s men. Posh scored first against a team in abysmal form yet capitulated before the break thanks to some casual passing and some atrocious defending. Vaughan was clinical, but my word he had some help from a team who have been defensively solid for most of the season. Bury fielded a very attacking 4-3-3 formation - clearly believing the best way to combat the worst defensive record in League One was to go gung-ho. It left space for Posh to exploit also and they did in the fourth minute when Gwion Edwards’ shot from outside the area was spilled by home ‘keeper Rob Lainton leaving Nichols to reach double figures for the season with a tap-in. But Vaughan smashed home a terrific equaliser from the edge of the penalty area after Posh skipper Chris Forrester had lost possession. The home side tactic of using forward Hallam Hope to pressurise Forrester yielding a quick dividend. Vaughan then went on a personal scoring spree, netting three further times in a 10 minute spell. He was left free to head home a corner from six yards on 19 minutes, given two attempts to complete a hat-trick after a right-wing cross was deflected into his path on 23 minutes and then he was again left alone to bury another opportunity following a right wing cross from 10 yards on 26 minutes. Vaughan almost claimed a fifth goal with a glancing header, while Posh were left to rue a superb save from Lainton after Junior Morias had sent Paul Taylor through at 2-1 down. Another fine Morias pass sent Edwards through in first-half injury time, but he chose to try and pass to Nichols rather than shoot and the chance was gone. McCann sent his players out early for the start of the second-half. He also made three substitutions with Lee Angol, Marcus Maddison and Martin Samuelsen replacing Taylor, Leo Da Silva Lopes and, rather surprisingly, central defender Ryan Tafazolli. Posh went three at the back, played Edwards and Maddison as very attacking wing-backs. There was improvement - it was really difficult not to improve - and if Angol’s fine chip from 20 yards had dropped in rather then been tipped onto the bar by Lainton, there might well have been better to report. Maddison also clipped a shot onto the top of the crossbar, but Bury were also dangerous on the break with Vaughan sidefooting a shot against a post. Lainton, who had a mixed afternoon, then spilled a low Maddison cross behind him only for Anthony Kay to hook off the line. And to cap a miserable Posh day, goalkeeper Luke McGee, a star of the Posh season, presented the home side with a fifth goal when reaching a long ball first, but seeing his attempted pass blocked by substitute George Miller who rolled the ball into an empty net 18 minutes from time. Angol then hit the bar for a second time when diverting a fierce strike from Maddison onto the woodwork from close range. Maddison also went close late on, but even a second consolation goal proved impossible on an afternoon to forget. Posh: Luke McGee, Michael Smith, Andrew Hughes, Michael Bostwick, Ryan Tafazolli (sub Lee Angol, 46 mins), Chris Forrester, Gwion Edwards, Leo Da Silva Lopes (sub Martin Samuelsen, 46 mins), Paul Taylor (sub Marcus Maddison, 46 mins), Tom Nichols, Junior Morias. Unused substitutes: Mark Tyler, Jerome Binnom-Williams, Brad Inman, Callum Chettle. Bury: Rob Lawton, Greg Leigh, Anthony Kay, Reece Brown, Cameron Burgess, Scott Burgess, Jacob Mellis (sub Kelvin Etuhu, 76 mins), Taylor Moore (sub Neil Danns, 55 mins), Hallam Hope, Tom Pope (sub George Miller, 68 mins), James Vaughan. Unused substitutes: Ben Williams, Jacob Bedeau, Callum Styles, Jack Mackreth. Goals: Posh - Nichols (4 mins). Bury - Vaughan (7 mins, 17 mins, 23 mins & 26 mins), Miller (72 mins). Cautions: Posh - Tafazolli (foul), Bostwick (foul).